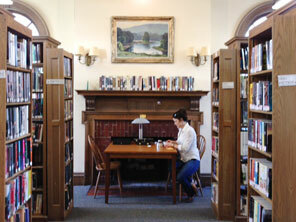 Tilton Library has always depended on bequests and donations. In fact, the Library owes its existence to the bequests of Chauncey B. Tilton and Esther Dickinson, which provided for a free public library in Deerfield. Tilton Fund, Inc., is a 501(c)3 non-profit organization. Donations are tax deductible. There are different ways to contribute financially to the well-being of the Library. Help Tilton Library & future generations. You may choose to remember a family member or friend with a gift for books or general support. When the Library receives a cash gift for the purchase of memorial books or collections, the selection will be made by the Library. The name of the donor or person memorialized will be designated on a special bookplate at the request of the donor. A gift in honor of a teacher, a librarian, someone’s special birthday or anniversary, or any living person is also welcome. Funds may be designated for new furniture, equipment or special programs in the Library, such as a lecture series or author visits. You may earmark your donation for specific areas of acquisitions (such as children’s books or music CDs) within the Library’s collection.